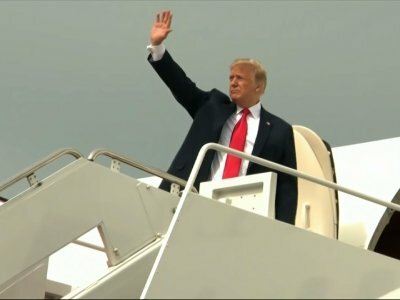 WASHINGTON (AP) — Envisioning “a very special moment for world peace,” President Donald Trump announced Thursday he will meet North Korea’s Kim Jong Un for highly anticipated summit talks in Singapore on June 12. He set the stage for his announcement by hosting a 3 a.m., made-for-TV welcome home for three Americans held by Kim’s government. “We welcomed them back home the proper way,” Trump told supporters at a campaign rally in Indiana Thursday evening. Final details in place, Trump and Kim agreed to the first face-to-face North Korea-U.S. summit since the end of the 1950-53 Korean War. It’s the most consequential and perhaps riskiest foreign policy effort so far in Trump’s presidency as North Korea’s nuclear program approaches a treacherous milestone — the capacity to strike the continental U.S. with a thermonuclear warhead. Trump says the U.S. is aiming for “denuclearization” of the entire Korean peninsula, but he has yet to fill in just what steps that might include and what the timing would be. “We’re starting off on a new footing,” Trump said of himself and Kim as he welcomed the detainees in a floodlit ceremony at Joint Base Andrews outside Washington. He hailed their release as a potential breakthrough in relations between the longtime adversary nations. The ceremony, which also featured a giant American flag suspended between the ladders of two firetrucks, emphasized Trump’s penchant for the dramatic as he raised expectations for the summit. And it underscored how closely the fate of his foreign policy agenda is being tied to the North Korean negotiations. Vice President Mike Pence, Secretary of State Mike Pompeo, other top officials and first lady Melania joined the president for the air base celebration. The former detainees — Kim Dong Chul, Kim Hak Song and Tony Kim — had been released Wednesday at the end of Pompeo’s visit to North Korea. They appeared tired but in excellent spirits, flashing peace signs and waving their arms as they emerged from the aircraft. One said through a translator, “It’s like a dream; we are very, very happy.” They later gave the president a round of applause. Pence said Pompeo had told him that at a refueling stop in Anchorage, “one of the detainees asked to go outside the plane because he hadn’t seen daylight in a very long time.” The men were taken to Walter Reed National Military Medical Center for evaluation before being reunited with their families. Trump thanked North Korean leader Kim for releasing the Americans and said, “I really think he wants to do something” on denuclearization. Sen. Cory Gardner of Colorado, who was among several Republican lawmakers who dined with Trump and National Security Adviser John Bolton Wednesday evening before the detainees returned, said their release was a positive development, but he remained cautious about North Korea’s intentions. White House spokesman Raj Shah said the country has relationships with both the U.S. and North Korea, meaning both presidents’ security — and a sense of neutrality — can be assured. “Since their independence, they’ve very deliberately developed a reputation as an honest broker between East and West,” said David Adelman, the former U.S. ambassador. North Korea had accused the three of anti-state activities. But their arrests were widely seen as politically motivated and had compounded the dire state of relations over the isolated nation’s nuclear weapons. — Kim Dong Chul, 64, a South Korea-born U.S. citizen and the longest-serving detainee. He received a 10-year prison term with hard labor in April 2016 for allegedly “perpetrating state subversive plots and espionage against” North Korea. Before his sentencing, the former Virginia resident publicly apologized for slandering North Korea’s leadership, collecting and passing confidential information to South Korea and joining a smear campaign on the North’s human rights situation. Other foreigners have publicly admitted crimes but have said later their confessions were given involuntarily. — Tony Kim, who also goes by the Korean name Kim Sang-duk, had a master’s degree in business administration from the University of California, Riverside, and taught accounting at a private university in Pyongyang. He was detained at the Pyongyang airport for “criminal acts of hostility aimed to overturn” North Korea, according to the North’s Korean Central News Agency, which didn’t detail those acts. — Kim Hak Song, who worked in agricultural development at an experimental farm run by the same school, the Pyongyang University of Science and Technology. He was accused of engaging in unspecified “hostile acts” against North Korea.